With an approving boom of thunder, Cori Blaschke received her award, knowing that her ancestors were there, with her, supporting her. Blaschke was on stage at the time, receiving the Chairman’s Leadership Award at the Wisconsin Gaming Regulator Association’s conference on June 15, 2018. “When Chairman Ernie Stevens said something about the thunderclap, I informed him my Ho-Chunk name is Wakajaguiga, which means ‘Coming Thunder.’ It was so fitting,” Cori said. The convention was held June 13-15 at the Mohican North Star Casino in Bowler, Wisconsin. “Cori was nominated because of her professional and active participation in all matter related to her responsibility as a regulator and her role with the regulatory association. Her nomination reflected upon her active and responsible representation of the industry,” Stevens said. “This national recognition is a reflection of our many years in collaboration with the vitally important regulatory associations at the local, regional and national levels,” he said. Cori had no idea she was being considered for the award until Mark Powless Sr., chairman of the Oneida Gaming Commission, mentioned to her that he nominated her for an award. She dismissed the comment and didn’t think anything more about it. Then, at the convention, Chairman Ernie Stevens Jr. of the National Indian Gaming Association closed out conference. At the end of his speech, he announced that he had three awards for Gaming Regulators who had been nominated by their peers for their work in the industry. She was greeted onstage by Stevens and Andrew Hofstetter, chairman for the Tribal Gaming Protection Network (TGPN). “There was a storm outside and we could hear the soft rumblings of thunder and rain pelting on the roof,” Cori said. “As nervous as I was, I don’t remember exactly what I said, but I was very honored, humbled, and thankful for the award. “I remember stating that this month was the last term in my Gaming Commission, so the acknowledgement from my peers was very much appreciated. As soon as I said ‘appreciated,’ a loud clap of thunder shook the building, as if my ancestors were showing their pride which made me stand taller as I left the stage,” she said. 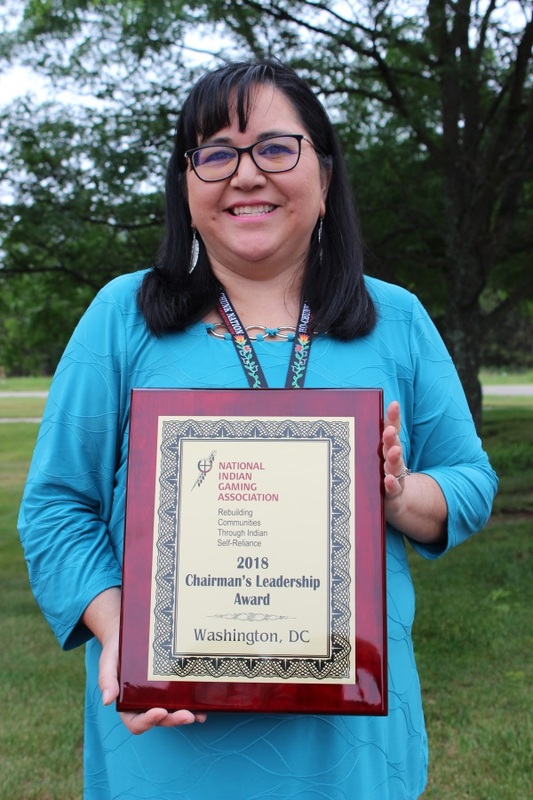 National Indian Gaming Association Chief of Staff Debbie Thundercloud said that Cori is a well-deserved recipient of the award.